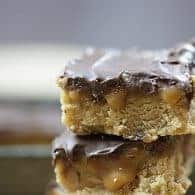 These salted caramel RITZ bars are so quick to prepare and everyone loves the sweet and salty flavor! Big thanks to NABISCO for supporting this post. Thank you for supporting the brands that support this blog! We had a bunch of friends over the other night and I had a cookie jar full of cookies and a pan full of these bars and do you know what happened? No one even opened my cookie jar. Everyone was going crazy for these bars. It’s like once they got a look at them they couldn’t even think about the cookies. Then they had a bite and it was game over. These things are dangerously good and so stinkin’ easy to make! You’re going love them, because they only need 6 ingredients and 10 minutes in the oven. Hands on time is about 10 minutes, tops. I teamed up with NABISCO to create this recipe for you as part of their 115 Moments of Joy anniversary celebration. That’s right – NABISCO has been bringing all of us some of our favorite crackers and cookies for over a century now and they’re celebrating by giving away daily prizes for the rest of the year! I would love to help you all have your own moment of joy with one (or two!) 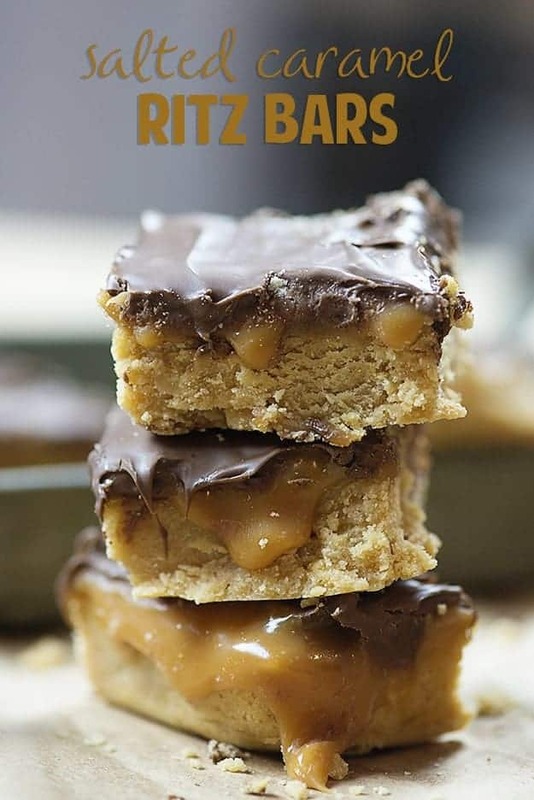 of these delectable salted caramel RITZ bars, featuring RITZ Crackers! Just look at the oozy caramel. 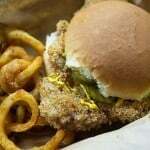 It’s beckoning to you, isn’t it?! Another way to celebrate? By winning some dolla bills, y’all. Text NABISCO for a chance to WIN $115,000! They’re giving away $1,150 daily too! Here’s how to enter: TEXT a picture of yourself and any NABISCO product or recipe to 59526. You can enter the promotion every day through 12/31/16. For more details about 115 Moments of Joy, including how to enter without a purchase, visit www.NABISCO115moments.com for more details! 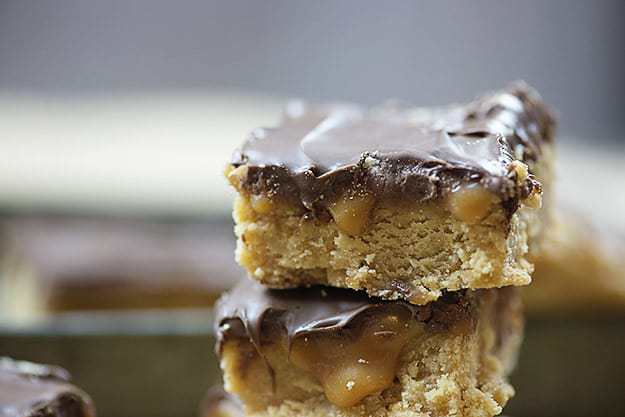 Just a handful of ingredients to make these ooey gooey caramel bars! Add RITZ crackers to a food processor or blender and process until you have fine crumbs. Stir together the cracker crumbs and condensed milk in a medium mixing bowl. Press mixture into an 8x8 baking dish and bake for 10 minutes. While crust is baking, add the caramel candies and whipping cream to a small bowl and microwave for 3 minutes or until melted, stirring every 60 seconds. Remove crust from oven and immediately pour the caramel sauce over the top. Sprinkle with sea salt. Sprinkle the chocolate chips over the caramel sauce and let sit for 5 minutes to melt. Spread the melted chocolate chips over the caramel and let harden in the fridge for at least two hours before cutting and serving. Sweet and salty is the best! OMG, this looks mouthwatering delicious. Love it!!!! I love these bars! That gooey caramel looks so good! Would these need to stay refrigerated because of the condensed milk? Thinking about making these for cookie party. So did you use all 4 sleeves of crackers? Is this 1 box of ritz crackers 200 grams? It would be closer to 400 grams. I know this comment will not be received well but this recipe did not work at all for me. The finished product did not resemble the picture in any way and, after going to 4 stores to find the caramels, there was no caramel taste to be found in these bars. Also, they were very difficult to cut. I followed the recipe exactly and I am now left with what was supposed to be a Christmas treat for my family that they are not interested in eating. I would advise anyone making these to double the number of caramels. I’m sorry to hear this one didn’t work out for you. Jaw dropping open, trying not to lick screen. OMG. This looks seriously delicious Karly. Hi there! 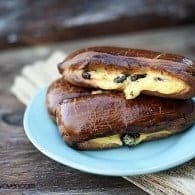 Making these tonight and had a quick question…Did you use milk chocolate chocolate chips, or the usual semisweet chocolate chips with this recipe? Thanks! Hi there! I use milk chocolate, because that’s what my family likes. 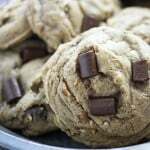 Any type of chocolate chip you prefer will work great here though! When I crushed the whole box of crackers and used the can of sweetened condensed milk, my mixture came out kind of crumbly, not moist like the video. What am I missing? Are you sure you used the correct size packages of crackers and condensed milk? The mixture isn’t super moist, but it’s also not really dry. Hope it worked out for you when you baked it! I made one batch following the recipe and thought it was ok, but needed something more. Today put half the cracker mix into the pan, then added 1/2 cup peanut butter to the other half of the cracker mix before spreading it on top then following the recipe as written. It is AMAZING! What can I use if I don’t have heavy cream? We did not care for these. The top layer was great, but the bottom was very bland and crumbly. We ended up cutting the bottom layer off and just eating the top. 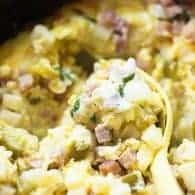 How can I make this in 9 x 13 pan? I made these today with my 3 year old for an after-school snack for his brother and sister! Super easy recipe, I followed the exact directions. They won over all 3 of my picky eaters, and they can’t wait to share them with their dad after supper! Can you substitute ritz crackers itch ritz premium plus crackers (soda crackers)? I haven’t tried it myself so I can’t say for sure. Can you substitute ritz crackers with ritz premium plus crackers (soda crackers)? I bought the wrong ones! The bottom layer came out like a no-bake fudgy solidified mush (sorry, I don’t know how else to describe it) – not what I was going for. 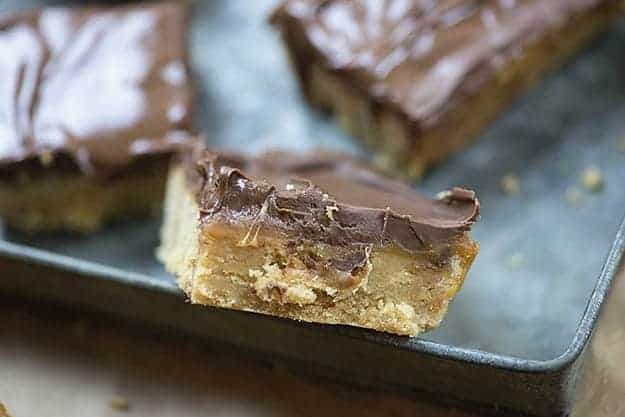 I’ve had the basic Ritz bar recipe before and it was much better. I’m now comparing to other recipes and they call for 20 minutes in the oven. I should have gone with my gut when I pulled it out of the oven and baked until it looked ‘done’. Can I use half and half instead of heavy cream with the caramels? Hi! Can I use caramel (apple) dip in lieu of the caramel candies? 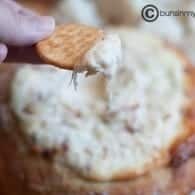 Have you ever used Townhouse crackers vs Ritz? I haven’t tried this with caramel apple dip. Not sure that it would set up the same. Townhouse crackers should be great here. Followed instructions as is and they came out exactly like picture we liked them! 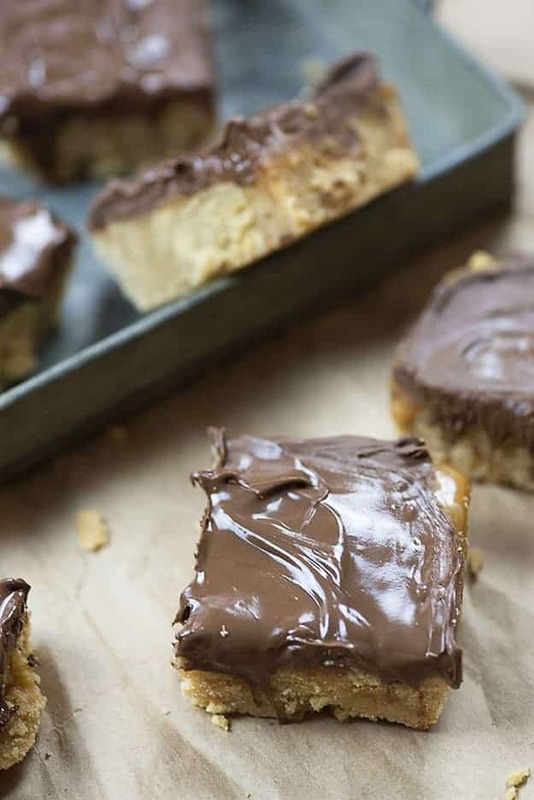 I made these with chocolate sweetened condensed milk. Everything else I left the same and followed the recipe exactly. They turned out amazing and there were no leftovers. Ooh, I didn’t even chocolate condensed milk was a thing. Sounds amazing! I was disappointed in the results of this recipe. I wish I would have read the reviews first. I do think with the proper tweaks, this could have potential, but as written the proportions are very off. Way too much crust to topping and it completely overpowered the flavors in the toppings.